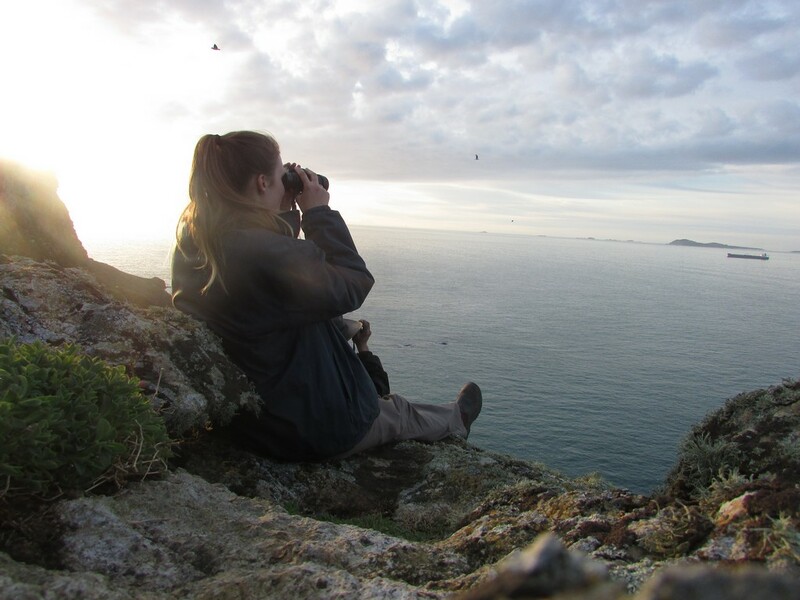 My name is Jane and I am fortunate enough to be one of the Long Term Volunteers here on Skomer Island. 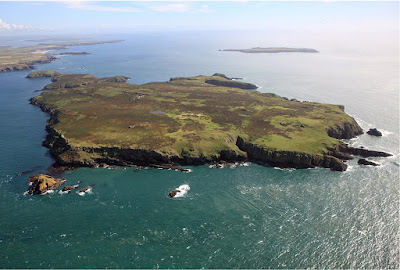 This is not only my first time to Skomer, but also my first time to Great Britain, and Europe! I’ve conducted my own northward migration and have arrived from my home in Victoria, Australia. My most recent role was as Assistant Warden at the Broome Bird Observatory in North Western Australia. Needless to say I noticed a stark contrast in climates and have only now downgraded from two to one hot water bottles at night. 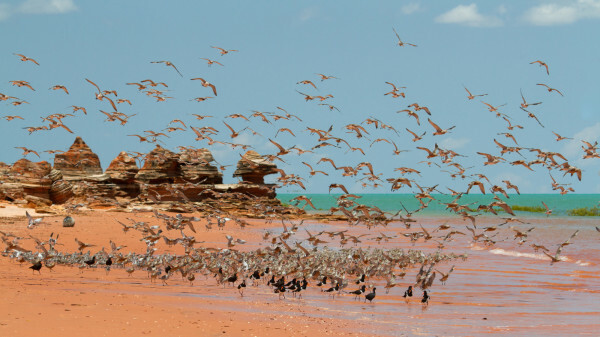 The Broome Bird Observatory is famous for its Waders which in their hundreds of thousands utilize Broome’s nutrient rich mudflats. Shorebird identification is often considered meticulous and difficult…but UK birds have certainly lived up to their reputation of being LBJ’s. 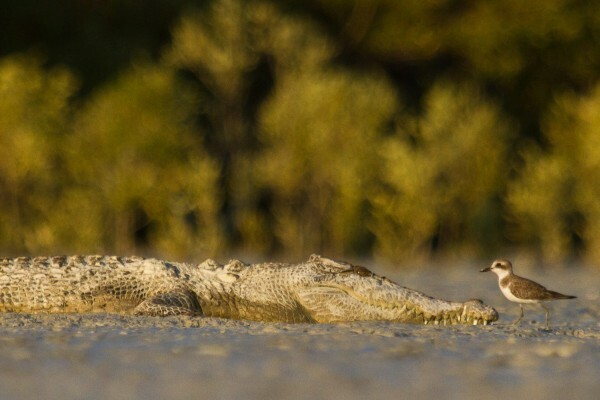 Although Broome Bird Observatory is itself in a remote location there are unique challenges with island living. Have you ever stopped and considered how an entire fleet of full gas bottles makes their way onto an island? I hadn’t either, before I donned waders and reversed the tractor across our rocky beach to load the inflatable boat with gas bottles. It really is amazing to have the opportunity to explore the island. With each change of the tide and with the change of seasons (I think this is what the Brits consider ‘summer’) a new world is exposed and presents a shift in the flora and fauna on the island. 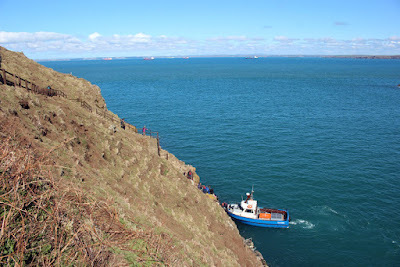 Bluebells have carpeted the island and the Red Campion has also begun to flower. 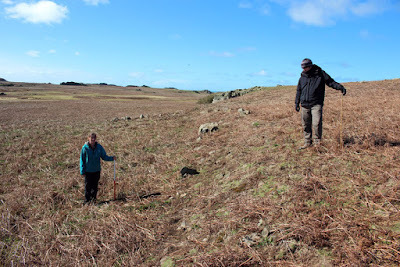 The bare brown grass that dominated most of the landscape for the last six weeks has now been transformed into fresh new shoots of bracken, poking up through winter’s debris. A steady flow of summer migrants have made their way across the island and its amazing to see new species like Pied Flycatcher, Spotted Flycatcher, Swallows, Blackcaps, Wood-chat Shrike, Sedge-Warblers. Meadow Pipits, Blackbirds, Mallard, Wheatear, Linnets and Pied Wagtail can all be seen busily nest building as we conduct our Breeding Bird Surveys. The hundreds of seals that hauled out into North Haven each low tide have been slowly disappearing- only to return in autumn to have their pups. 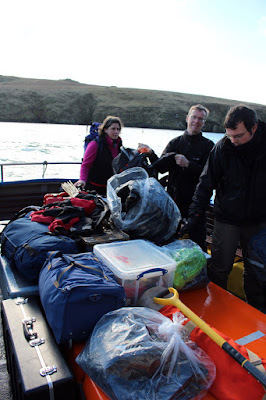 It’s been a fascinating first few weeks and I can’t wait to see what the rest of my time at Skomer Island brings! 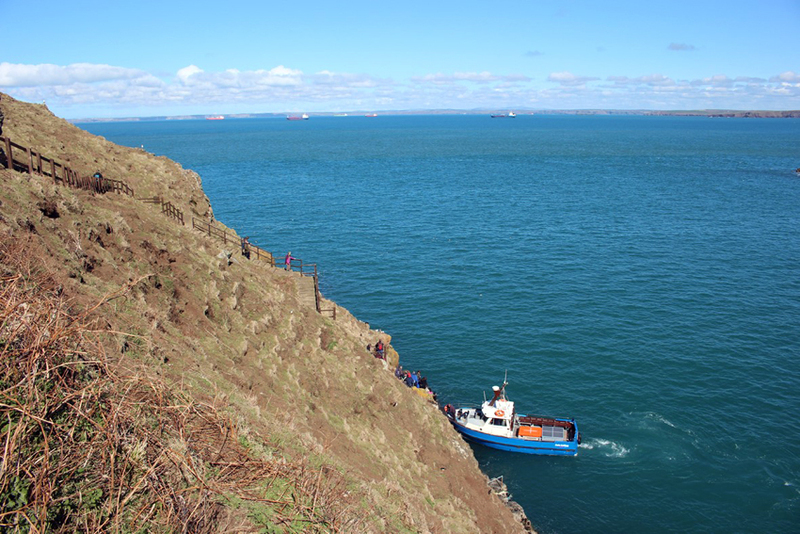 As many of you will know, Skomer Island is not only famous important for its breeding seabirds and other wildlife, but it also boasts significant historical importance, with some of the best preserved ancient iron-age structures in Britain. 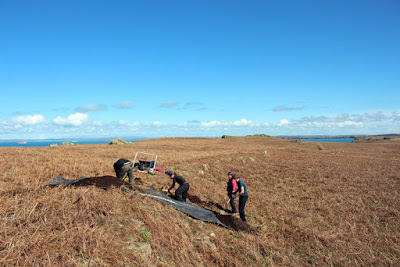 Over the last couple of years Skomer has hosted teams from Sheffield, Cardiff and Aberystwyth Universities, conducting various excavation and geophysical work. The team has kindly written a guest blog, which you can enjoy below. 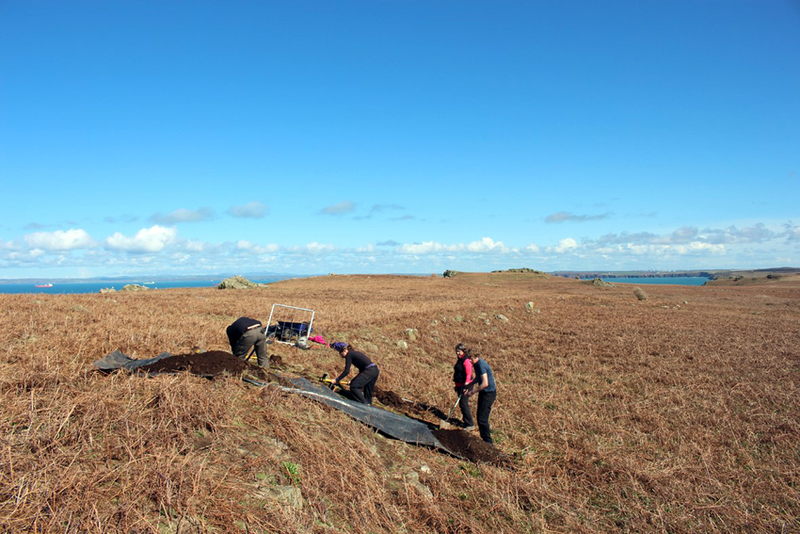 Last week, the Skomer Island Project team returned to Skomer to undertake the latest phase of archaeological research on the Island. This year archaeologists Louise Barker and Toby Driver (RCAHMW), Bob Johnston (University of Sheffield) and Oliver Davis (Cardiff University) were delighted to be joined by geographer and environmental scientist Sarah Davies of Aberystwyth University. The focus of our small evaluation trench was a substantial lynchet, part of the Northern Field Systems on the Island. 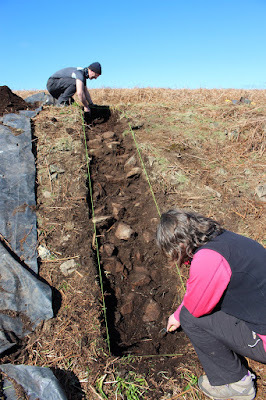 A lynchet is a bank of earth that builds up on the downslope of a field ploughed over a period of time and the resulting earth or plough soil is important for helping us reconstruct the environmental history of the Island, identify what was being cultivated and possibly at what date. Therefore, the principal focus of the excavation was to recover samples of the soils within the lynchet which will now be carefully analysed over the coming months. 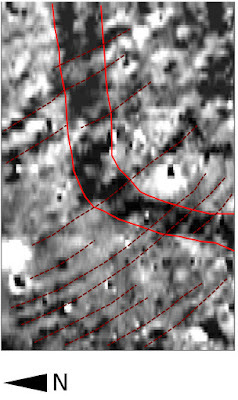 Preliminary results from the geophysical survey also look positive. 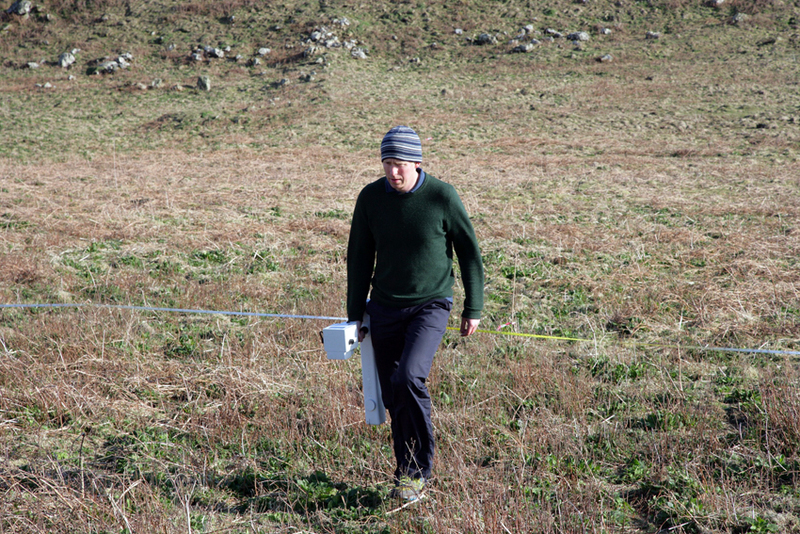 Within the improved fields surrounding the farm in the centre of the Island, there is little evidence for surviving archaeology; however geophysics undertaken in 2012 did reveal sub-surface archaeological features and we wanted to see if this was the case elsewhere. This was indeed the case, and in the area surveyed directly to the west of the farm, the gradiometer detected a linear feature, perhaps a ditch cut by later cultivation ridges.